appeared in the Observer-Dispatch April 17, 1994. I didn’t mean to hurt Eddie House, but I did. House is an emergency medical technician with the Vernon Center Fire Department. I had taken a front page photo of him weeping after he had tried to revive a 3-year-old victim of a car accident. It showed House on the back of a rescue truck crying as another volunteer wrapped her arms around him, with their hands on his aching heart. The photo, to me, was an image of a rescue worker, who was so dedicated to his work, it could even make him cry. 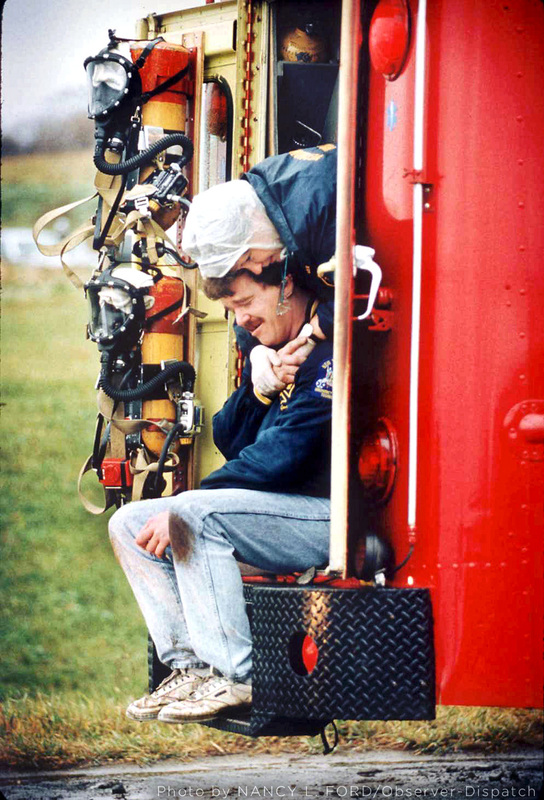 It was not just a photograph of Eddie House the EMT, but of all dedicated rescue workers. It was a rare glimpse inside the hearts of them men and women who deal with the ugly tragedies that happen every day. So why would a photo that I consider to be a tribute to rescue workers hurt and offend House? House found out that it wasn’t and that anyone in any public place is fair game for photographers. Also, a photographer can shoot photos of anyone on private property if they have permission from the owner of the property. It can be very difficult for a photographer to photograph someone having a private moment in a public place. You have to put your feelings aside, and sometimes that is hard. I’ve met a lot of people who think that photojournalists get some sort of thrill taking such pictures. These people are wrong. It can be just as uncomfortable for the photographers taking the pictures as it is for the subject. I know this is true for everyone on the photo staff here at the Observer-Dispatch. One of the most difficult assignments we have to cover are funerals. It is extremely uncomfortable and we do not want to be there. 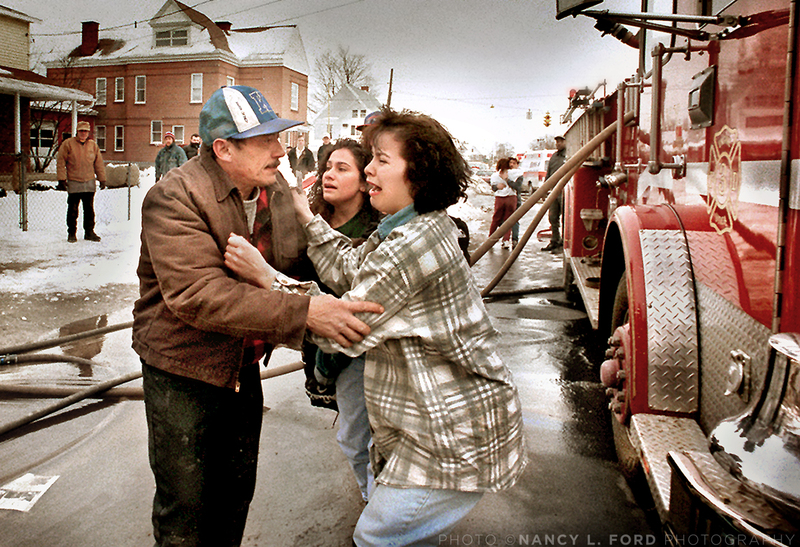 O-D photographer Elizabeth A. Mundschenk was once sent to cover the funeral of a 16-year-old girl who was murdered. Being a high-profile case, the editors had decided it should be covered. Our objective as journalists was to show how this death had devastated the community. As Mundschenk stood outside the church with her camera in hand, she had to face obscenities from classmates of the girl. Each photographer on our staff can remember crying at one time or another after being overcome with emotion while on assignment. I cried back in the photo lab the night I took the photo of Eddie House. And I remember how hard I cried while covering the Trinkaus Manor fire. I could hardly focus my camera as I watched something that was so dear to the community being engulfed in one giant fireball. When I saw tears flowing from the eyes of one of the Trinkaus brothers, I took a photo, then started crying even harder. So why do we take these kinds of photographs, and what purpose do they serve? As journalists, it is our job to go out and experience things for those who are not present, and sometimes capture the story in just a single photo. We let them know if it was happy, sad, hot, cold, surprising or boring. We have to sum up a situation and decide what photo would tell this story best. It is not always going to be happy. But even the most graphic photographs can serve some purpose. These types of photographs remind us to buckle up, not drink and drive, check our smoke alarms and even to appreciate our local volunteer firefighters, like Eddie House. I’m glad House now knows that my intentions were not to hurt him. We want all of the subjects of our photographs to know that we were grieving with them and that we want our readers to feel what they were feeling, too. As House found out, it can bring a community closer together.